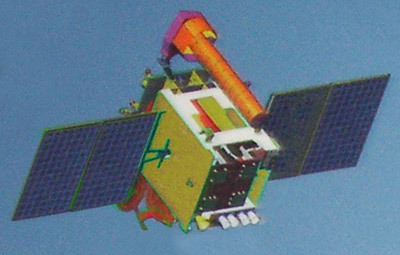 GSAT-7 / INSAT-4F or Rukmini is a multi-band satellite carrying payloads in UHF, S-band, C-band and Ku-band to be used by the Indian Navy. It was originally planned to be launched during 2011 onboard GSLV, but was instead moved to a commercial launch by an Ariane-5ECA rocket. It was successfully orbited in August 2013 and positioned at 74º East. The satellite weighs 2650 kg with a payload power of 2000 W and mission life of 9 years. The multiple-band spacecraft will be used exclusively by the Navy to shore up secure, real-time communications among its warships, submarines, aircraft and land systems. GSAT-7/ INSAT-4F is said to significantly improve the country’s maritime security and intelligence gathering in a wide swathe on the eastern and western flanks of the Indian Ocean region, among others.